Leech Shola by Bison Wells. Evergreen rain forest apparently once extended down the valleys and slopes of the Palni Hills almost to the plains. 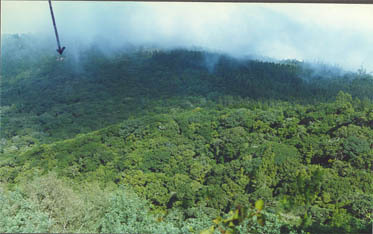 One relatively large patch of evergreen forest survives on the north-west edge of the Palni plateau west of the settlement of Kookal. It lies on the flanks and crest of a north-south ridge and is mostly between 6,400 and 6,900 feet altitude. On parts of the ridge crest there is also a stunted dry woodland. Commanding a fine view of the eastern slopes of this ridge is lodge "Bison Wells." In fact, the shola fringes the boundary of the Bison Wells property. Beyond the forest is the most extensive remaining grassland wilderness of the Palni Hills, merging with the Indira Gandhi National Park. Arrow points to Lodge Bison Wells shown in relationship to environment.